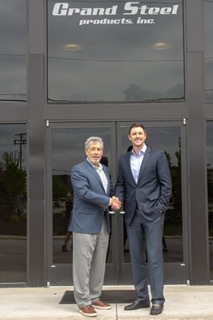 Grand Steel Productions Inc. (GSP), a flat rolled steel service center and steel distributor located in Wixom, announced Michael Barnett as president and COO. After graduating from Western Michigan University in 2003 with a degree in finance and economics, Michael Barnett started off in the finance industry. He joined GSP in 2006 and has since overseen the growth of the company, which includes the purchase of an operations building in 2008, the purchase and installation of a slitting line in 2011, and office renovations and additions in 2014. He also assisted in the formation of Barnett Industrial Properties and Grand Steel Transport, where he is a partner. “Mike is a champion for a strong domestic steel industry and the growth of domestic manufacturing, working hard every day to promote the strength, growth, and change needed to sustain this and attending many industry events,” says Jim Barnett. Barnett has been active with the Association of Steel Distributors and has been a board member since 2013. He is also active with Friendship Circle, a nonprofit organization in West Bloomfield supporting individuals with special needs; the Children’s Tumor Foundation, a New York-based organization with a mission to end neurofibromatosis; and LUNGevity, a Chicago-based lung cancer-focused nonprofit.